The Grundfos Redi-Flo2® Electrical Submersible Pump provides smooth, uninterrupted water flow during groundwater sampling or conducting aquifer tests to depths down to 280 ft. (85m). Both high flow rates needed for purging and low flows recommended for sampling are achieved with the same pump. Purging and sampling with the same pump is extremely efficient. Flow rates range from 30 LPM to 100 mL/min. Portable solid state converter, eliminating the need for control valves. Portable or dedicated configurations available. The Grundfos Redi-Flo2® is quoted as part of a sampling sustem with the Redi-Flo VFD (Variable Frequency Drive). Designed for long-term reliability in dedicated monitoring wells, the Redi-Flo2® provides optimal sample quality with either traditional purging prior to sampling or low draw-down passive sampling when operated with the Redi-Flo VFD. 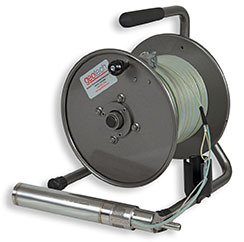 The VFD is designed to operate and protect the Redi-Flo2® pump. With the turn of a knob, an operator can precisely control the discharge flow rate from the pump from 8 GPM (30 LPM) to 100 milliliters per minute, to depths down to 280 feet (85m). Turn the knob or use the push button control for greater control over the discharge flow rate for better accuracy and precision during sampling. Not just one performance curve, the Geotech VFD covers a range of performances and can function at any point of operation within that range. Either 120V or 230V, single-phase AC input power is available. 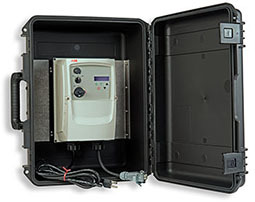 The NEMA 4x enclosure is designed for outdoor duty and is resistant to damage as a result of incidental exposure to rain. Designed for wash down applications. The Geotech VFD V/Hz pattern is specially optimized to allow the most efficient operation of the Redi-Flo2® variable performance pump. The Geotech VFD will protect the Redi-Flo2® Variable Performance Pump from adverse motor conditions such as, over- and under-voltage, over-current, and groundfault.